Green and Glassie: Earth Month 2014 ~ Join us! Earth Month 2014 ~ Join us! Earth Day is April 22nd, 2014. 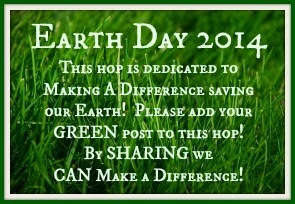 Each year I celebrate Earth Day as I see how we are getting better and better at recycling and reusing. This year I wanted to design a Earth Day Hop dedicated to being Green! A hop where all bloggers could add their Green post. As a blogger I read post daily about doing great things recycling, reusing and repurposing. I read articles explaining the need to conserve and the need to be wise about how we treat our Earth. I wanted a place where all for all of these great post to be so that anyone that wanted could access them. This Earth Month I will also be featuring companies that have gone above & beyond "To Make a Difference"
All Green Blog post are WELCOMED! Add your GREEN post to the LINKY! By Sharing we CAN MAKE A DIFFERENCE! All Green post are welcome - please join me in making our Earth a little bit better each day. I love the idea of celebrating the whole month for the earth... .what a fun idea! What a great linky ;) Thanks! Oooh! I got a few on my site. This is great! We've just gotten started on the Green section of our site so we should be getting started with some here soon. Thanks Lexie for linking to the hop! What a great idea! Thanks for this link up! i love earth day too it just seems like we should be living earth friendly all the time- it's all of our homes! I think this is a great idea! It's a wonderful way to bring more awareness to staying green! I don’t know if the little I do is enough to be considered worthy, but I do definitely try to green my world and to teach my children how they can be good to the earth and for the earth. I love your idea, and I appreciate your zeal! Thanks, I added a green post that could help others. I consider our home pretty green, but of course there are always way to improve! How perfect to link up a bunch of helpful posts together. Great idea! Great idea! We should celebrate Earth Day every day! I always want to find more ways to stay green. This sounds like a great idea. Thanks For The Linky we Should ALL Be Participating In One Way Or Another! sounds like fun, thank you for sharing! Oh going to have to add some posts to this! Gonna search and loving these ones! Such a beautiful idea you guys! One of the best parts of having a blog is being able to spread the word about things you're passionate about - so good on you! I was never earth friendly or aware until my kid convinced me to get it together.